Awards Ceremony for Youth Contest Winners and Presentation of New Documentary Videos: Tolerance and Diversity Institute (TDI) held an award ceremony for the youth contest winners. Throughout the contest, participants prepared blogs, articles, photo stories and videos on challenges related to tolerance and cultural diversity in their community. TDI also presented and moderated an active and inclusive discussion of three documentary videos - Ala, Liaman and Tarash. Meeting of Women Judges with Students at the National Institute for Human Rights: USAID/PROLoG organized a meeting of Judges with law students at the National Institute for Human Rights, Free University of Tbilisi. Judge Madi Chantladze and Judge Ana Gogishvili, Alumni of PROLoG’s Judicial Exchange program, spoke about their careers and challenges for women lawyers. 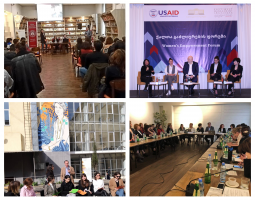 The activity aimed to enable dialogue between experienced women lawyers and a younger generation, as well as to raise the profile of women judges in Georgia. GTUC Presentation of Recommendations to Improve the Public Service Law: Georgian Trade Unions’ Confederation presented recommendations on the challenges of the implementation of amendments in the Public Service Law, with a special focus on women’s labor rights. The recommendations mostly covered issues related to women’s rights in public service, and conflicting regulations that remain as a challenge. Union Sapari Conference on “Challenges Identified in Civil Litigation Involving Domestic Violence:” organized by Sapari, the conference highlighted problems that frequently arise during civil and administrative litigation when dealing with cases of domestic violence, such as: alimony, defining child’s residence, court fees, etc. Along with Sapari, representatives of the Georgian Young Lawyers’ Association (GYLA) and Partnership for Human Rights (PHR) also spoke. 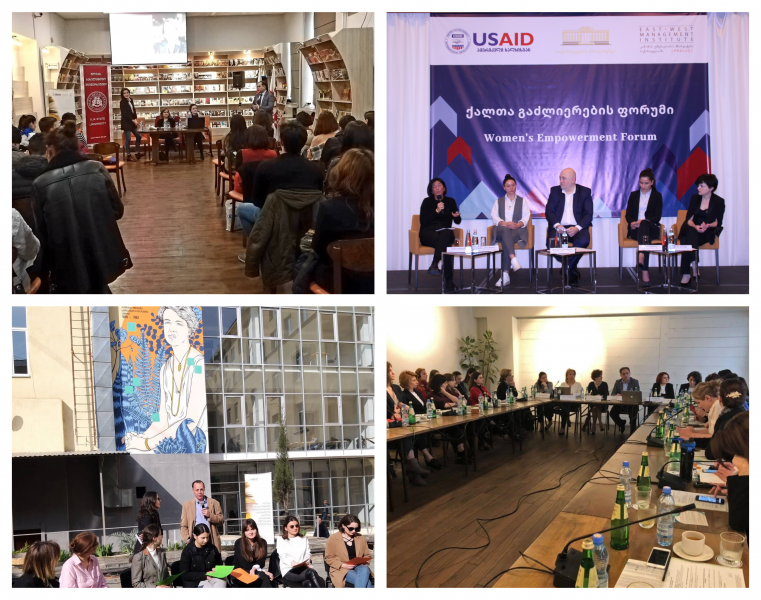 “Women’s Empowerment Forum:” the forum was held with support of USAID-PROLoG and participation of the Gender Equality Council of the Parliament of Georgia. The event was opened by the First Deputy Chairperson of Parliament, Tamar Chugoshvili and Ambassador Ross Wilson, Chargé d’affaires, a.i. the U.S Embassy in Georgia. Invited guests from the Parliament, Government, Judiciary, Public Defender’s Office, non-governmental organizations, as well as representatives of the sports, culture and business sectors, talked about the role of women in social and political life, their contributions and personal stories. Screening of the documentaries “Untold Herstories” and “He Named Me Malala:” Human Rights Film Club at Ilia State University hosted the screening of documentaries. “Untold Herstories” is a documentary which tells the story of three Georgian feminists from the19th and 20th centuries—Barbare Jorjadze, Ekaterine Gabashvili and Kato Mikeladze. “He Named Me Malala” is an American documentary, which tells the story of the young Pakistani activist and Nobel Peace Prize laureate Malala Yousafzai, who has spoken out for the rights of girls, especially the right to education, since she was very young. Public discussions and Lectures at Ilia State University: Human Rights Chair hosted public discussions on “Violence Against Children—Reality and Challenges” and “Domestic Violence and Violence Against Women.” Public lectures featured the following topics: ”Impunity for Sexual Violence —Gaps in Georgian Legislation” and “A Room of One’s Own —Women’s Right to Privacy”. Public reading of Eleanor Roosevelt texts: Human Rights Chair hosted a public reading “Eleanor Roosevelt — The Future Belongs to Those who Believe in the Beauty of Their Dreams.” Students of Ilia State University School of Law read texts of human rights activist, author, political figure and diplomat Eleanor Roosevelt in front of a13-meter mural in the inner yard of Ilia State University to celebrate her contributions to advancing human rights around the world. GYLA report presentation on “Significant Issues of Domestic Violence and Violence against Women:” Georgian Young Lawyers Association presented its analysis of domestic violence and violence against women, covering the legislative environment and practices over 2017 and 2018. The focus on these two years allowed GYLA to document progress since the creation of the human rights department with the Ministry of Internal Affairs, as well as to identify areas for further improvement.